Here we are at year's end. Seems like the year just started, in some ways, and yet not. Its been an interesting year for me. Physical struggles with my back and leg, a new grandbaby and one on the way, starting a business. We left the church we were a part of for 10 years, I did very badly on my eating plan, struggled at times with discouragement. But God has kept me close, and been a friend and encourager to me. I had the blessing of two trips this past year, one for our 30th anniversary last January, and one in late November to Texas. 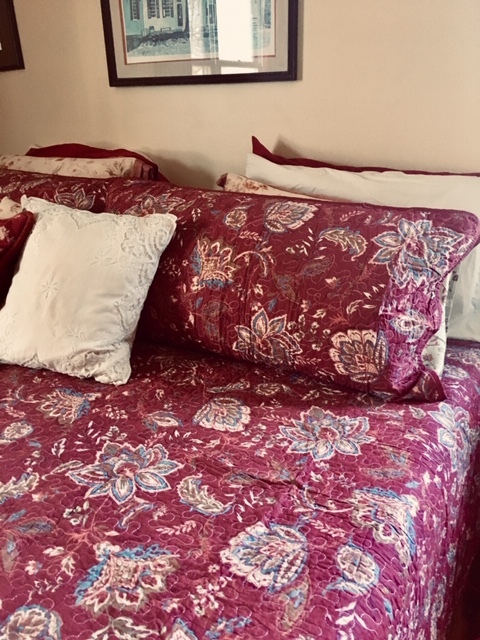 After needing a new bed for many years, I finally convinced Tim to upgrade to a king size. We bought a Lucid mattress and really like it. It took Tim a few days to adjust to it, but now he says his shoulder doesn't hurt anymore! Win! I hope you are enjoying your Christmas preparations as much as I am. We also are preparing for Tim's birthday (Christmas Eve), and the next week is Lindsay's birthday, and our anniversary. 1. If you've been around my blog for a few years, you recognize this video, I share it every year. 2. I love this version of O Come, O Come Emmanuel by the Franz Family. As you can tell I have very eclectic taste! I guess its because I have teenagers in my home that I am exposed to current music as well as all my favorites! This is my favorite song for this Christmas season. I hope you enjoy it! I've pinned a ton of diffuser blends on my essential oils Pinterest board. I love using oils in a variety of ways. I have two diffusers for the living room/kitchen space, since it is so big. I diffused this one yesterday, and I must say it was really lovely. This one is nice, too. I've been doing various blends on my own with clove, orange, cinnamon, but here is a blend with amounts of drops to use for each oil. This one is nice, and since Frankincense was one of the gifts of the three kings who came to worship Jesus, I thought it would be appropriate for the season! With fewer hours of sunlight, this time of year, we are in cold and flu season. We also have cold weather so we don't have doors and windows open. I like to diffuse this blend to clear the air in our house. We've been having fun, preparing for Christmas. Last Thursday while Emma and Family were still here, we made sugar cookies with the kids. The recipe is easy and delicious and you can find it here. The frosting recipe is good too, and was just right for an underlayer for sugar sprinkles or just by itself. Sunday afternoon we went to our friends' Christmas party, and participated in an ugly sweater contest. I won! When I saw this in Goodwill I knew victory was mine! We went to see the Christmas lights again last night! We took Rachel's boyfriend Weston and had a fun time. Donuts, coffee, music and lights all make for a great evening. 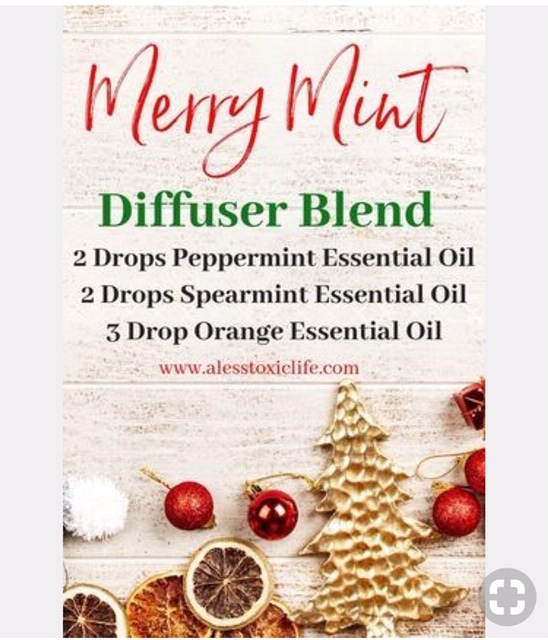 I've been trying Christmas diffuser blends this month and tomorrow I'll post which are my favorites! One week until Christmas Day! Thanks to a good friend, we were able to attend the show "Jesus" at Sight and Sound Theatres last evening. This show has been sold out most of the year, which is amazing, and because of that it will play all next year, too. It was really an incredible show, the special effects are stunning - the storm on the sea, and walking on the water, especially. So heartbreaking to see the hatred the religious leaders had for Jesus, the loss felt by his disciples, but the joy of the resurrection! We were happy to be able to include my parents and Emma and Vinnie. We got a 'groupie' with my parents as we were leaving last night. We are grateful for these special times we can have together, and especially this show, as we prepare to celebrate Christ's coming into the world to redeem us. On my antique chippy ladder, as I do every year! They are right behind the front door, in a little alcove made by the coat closet. Its a spot where no other furniture can go, but the ladder fits there just fine, and it is part of the living room. 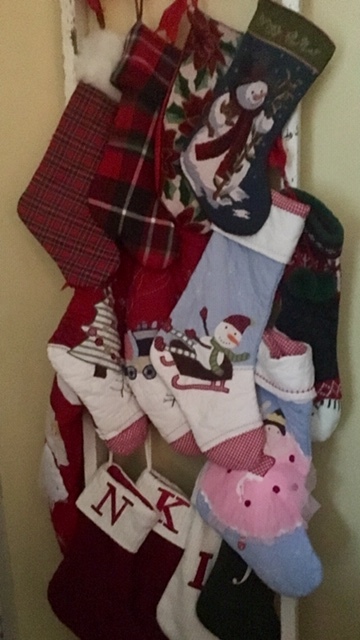 These are the stockings of the people who will be here Christmas Eve. Our tradition is to open stockings together in the evening of Christmas Eve. (earlier in the day we are celebrating Tim's birthday) We always have food to munch, and we either watch a movie or play games, sometimes both. On Christmas morning, my parents will come over to open presents with us, and the married kids will usually come by later in the day, at least for a while. Christmas is no stress here. We are savoring the day, thankful for the gift of our Savior, Jesus. We eat a lot, read, listen to music, play games, have company drop by. If the weather is nice, people might go for a hike. What are your traditions for Christmas Eve? Kyle is a fan of colored lights. He's always had them on his little tree in his room. This year he mentioned he wanted to hang lights all over his room, so that's what we did! I bought the white stringed lights, because of his ceiling being white. It looks like candy all over his ceiling! He came up with the pattern and we used command strips to put them up. His room is the only room in the house with colored lights. Its fun and cheery. But I still prefer white lights for my decor! This year the whole family has decided that we've grown too large to buy individual gifts for everyone, and so we've drawn names for everyone Kyle's age and up. We'd talked about it for several years, but Tim and I resisted because several of the 'kids' in our home would have needed us to buy their gifts to give to others, and so everyone would have one gift to buy and we'd have had to buy 4-5. But now this year, everyone has an income source and are fully on board with buying their person a gift. So, everyone from my Dad down to Kyle, drew names and we are all on the hunt for gifts for our person. Tim and I will buy for the kids still in our home, our grands, and each other. I think all the families in our family will do the same. Rachel arrived home Friday afternoon, and Emma and Vinnie arrived Saturday evening, with Isla and Clark. We gathered at my Mom's house yesterday to do our annual family photos. These are getting harder to do, but I love the results! Kamryn is the oldest of the cousins and loved holding Clark and playing with Isla. Lindsay sent me this photo and I love it. You can't tell but Rachel's legs are over on Sarah and Kyle and Kamryn are sitting on them, Isla was over having pictures taken, but did just fine. I'm so proud of this bunch of young adults and little ones. Amazing that these were the babies that God gave to Tim and I to raise! Now they are beginning to raise their own babies. I know this photo is blurry but it was so cute of Clark grinning at Grandpa! I got to hold him while he went to sleep last night. He is 6 months old now and we hadn't seen him in person since he was a week old! 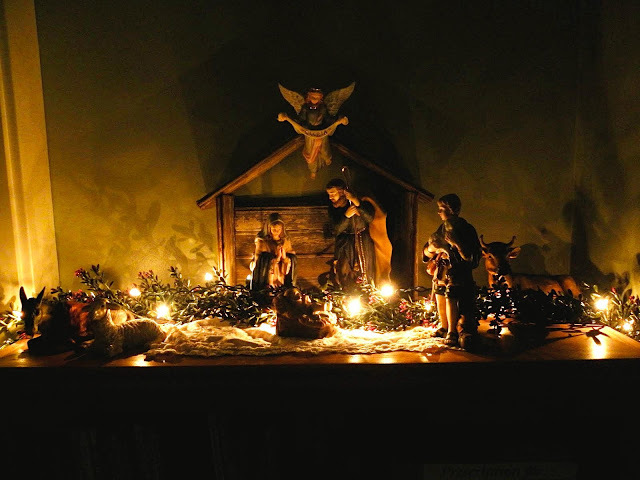 I thought, for my Friday Five, that I'd show you some of my Christmas decor. I keep it pretty simple with greens and plaids, mostly. 1. 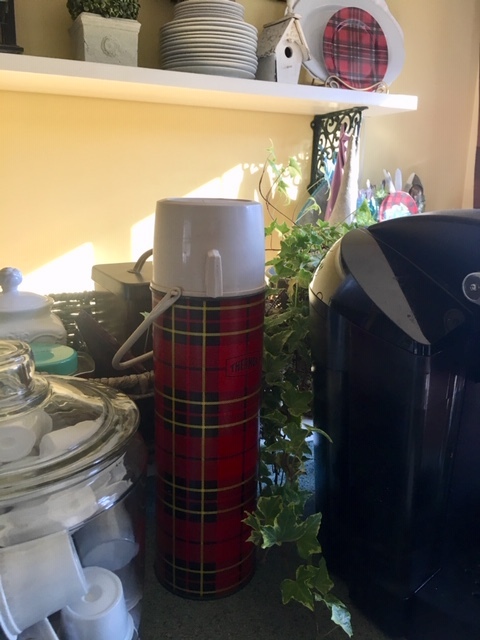 Plaid Thermos - I added my thrift store plaid thermos to the coffee/tea station in the kitchen. Along with the English Ivy, I think it adds a festive touch. 2. Plate Rack - My plate rack is over in the corner by the sliding French doors and doesn't get a lot of attention. I cheered it up with a cute plate and some fir branch from our Christmas tree. 3. Plate Wall - I added my Peace on Earth plate. I have a few more plates to add to the lower left side. 4. Snack Jars - I added a cute plaid ribbon to the animal cracker jar and it makes this space very festive! 5. Simple Old Fashioned Sign - The sign and the sweet cardinal, make this old clock and book stack ready for Christmas! Our Girls Road Trip was so fun, as you can imagine. After eating at Chuy's and staying the night in Austin, we drove to the capitol building. Unfortunately the gates were all closed and we couldn't get closer than this photo shows. We took the long way on the Hill Country Trail and saw beautiful live oaks and amazing vistas. We had lunch and did some shopping in Gruene (pronounced Green). This building is famous as it is historical and George Strait used to play here with his band, and its where he was discovered! We enjoyed a great lunch at the Gristmill! Outdoor dining in November? Yes, please! A narrated ride on the River Walk in San Antonio was a highlight of the trip for me. So much beauty. Our hotel lobby was beautiful, too! The next day we visited the Alamo. It is full of inspiration also.